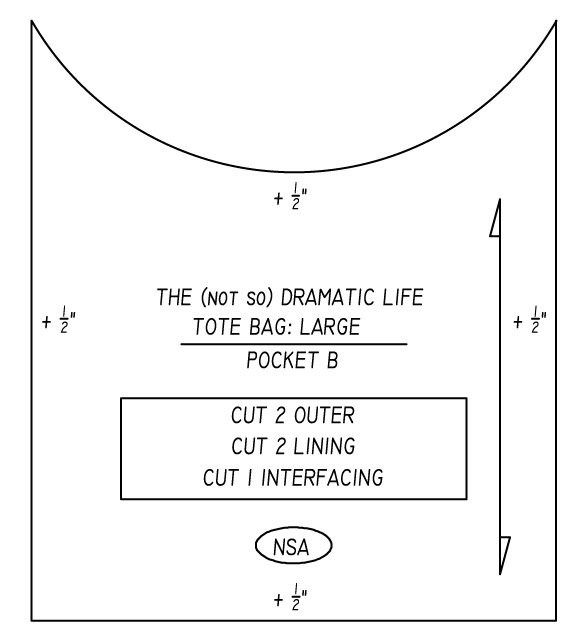 One of the most wonderful parts of this tote bag is that you can create the pattern to fit your personal needs. 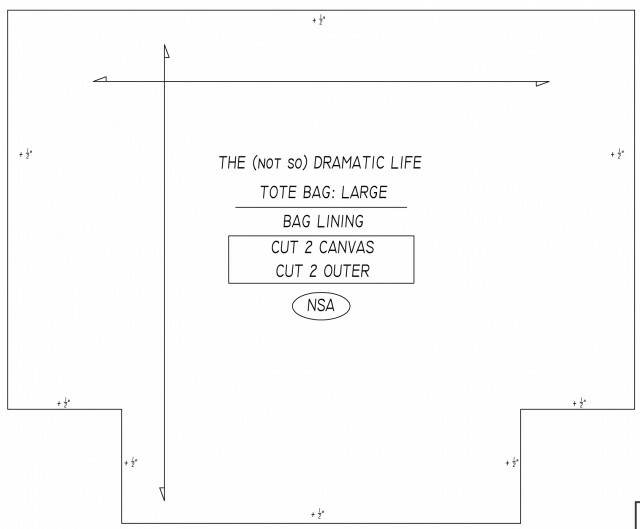 In this post we will go through the steps of drafting a full pattern for your bag. 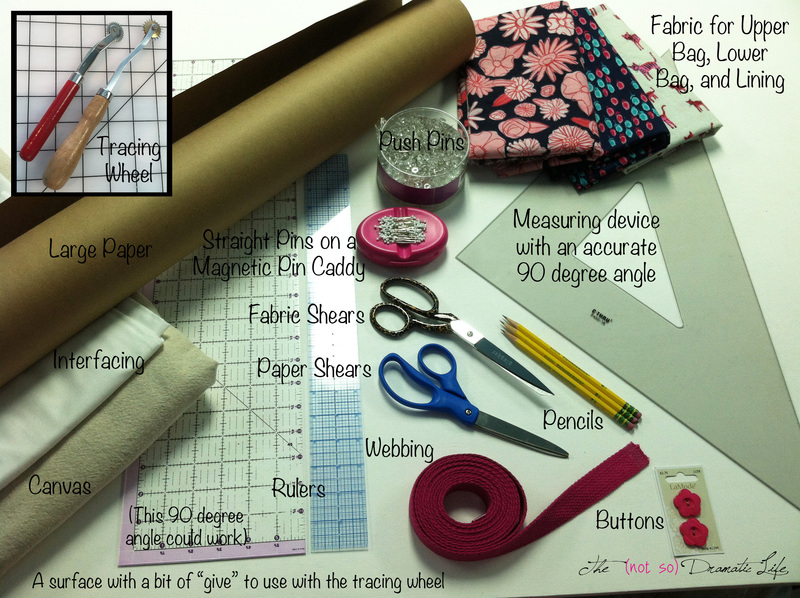 If you have never created a pattern before, you will probably be pleasantly surprised at how easy it is to do! I have taught this technique in person many times, but this is the first time I have ever put it all down in writing. This is a crazy long post! I have tried to give the most clear directions possible, but if anything is confusing or you have questions please email me. I will do my best to help you through this process. For the sake of clarity, the diagrams in this post are computer generated, but I usually create patterns using a roll of brown paper, pencils, a ruler, and a drafting triangle (or tailor’s/framing square, or large square rotary cutting ruler). There is a complete supply list with descriptions in Part 1. 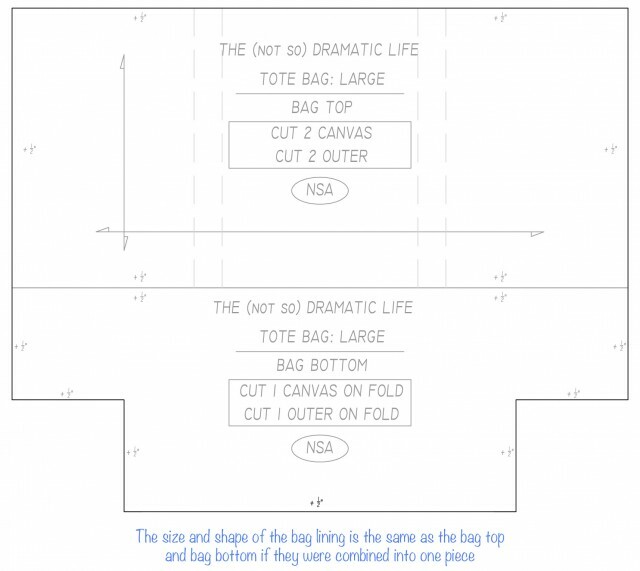 You will want to think about what you will use this bag for in order to determine the size you would like to make. The first pattern piece we will draft is the bag top. This piece is a rectangle. Maintaining 90° angles is the most important part of this piece. Using the largest triangle or square ruler you have, line up one side of the tool with either a straight drawn line or the edge of the paper. (Only use the edge of the paper if it is clean, smooth, and has not warping or contortions.) 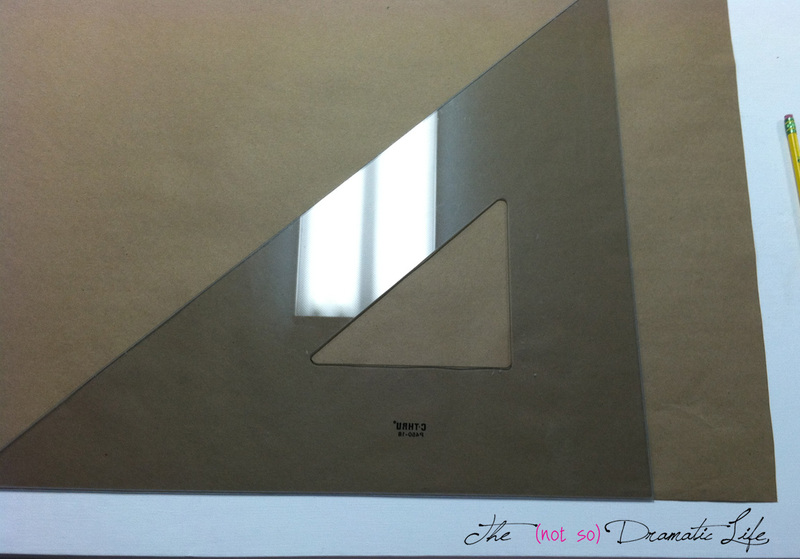 With the ruler or triangle carefully placed, draw a perpendicular line along the other side of the 90º angle. 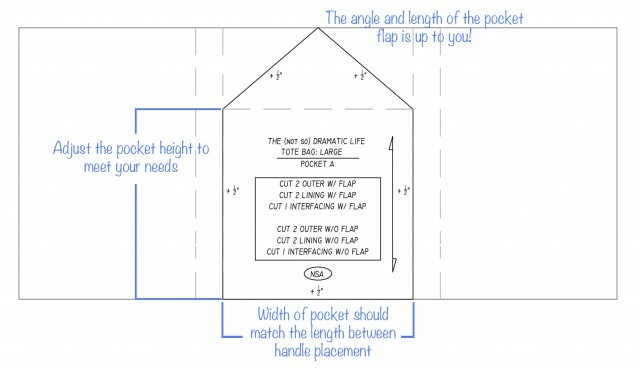 With the first angle created, you will make a mark along one line indicating the height of the piece (around 2/3 the overall height of the bag is usually a pleasing proportion). On the other line mark the line the width of the bag. You will cut two of this pattern piece (one front and one back), so the width of this piece will be half of the desired circumference of the finished bag. Use your 90 angle to draw the rest of the rectangle. 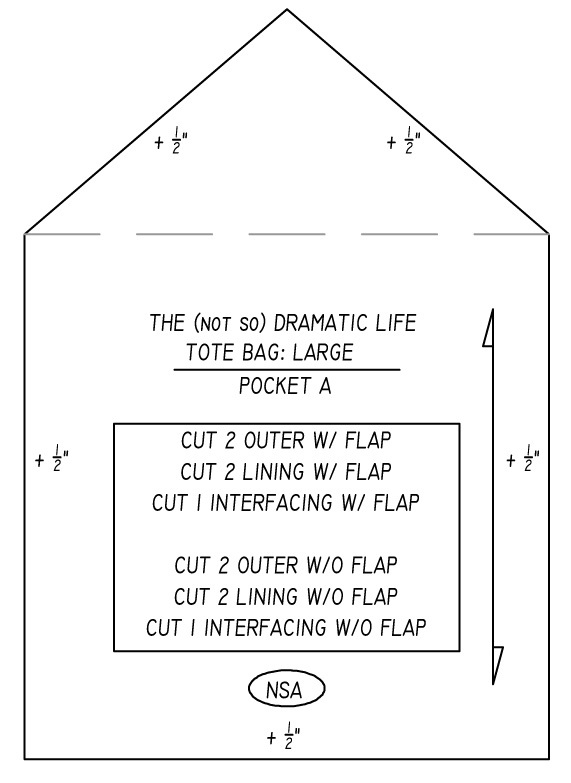 For this bag, the rectangle measured 22″ x 10″. Check the lengths of each side to make sure the measurements of the long sides are equal to each other. The lengths of the short sides should correspond to each other as well. To double check the accuracy of your angles, measure diagonally from one corner to the other and make note of the measurement. Then measure the other set of diagonal corners. If the measurements are equal, the angles are a true 90º! Do not add seam allowances to this, or any pattern piece at this point. 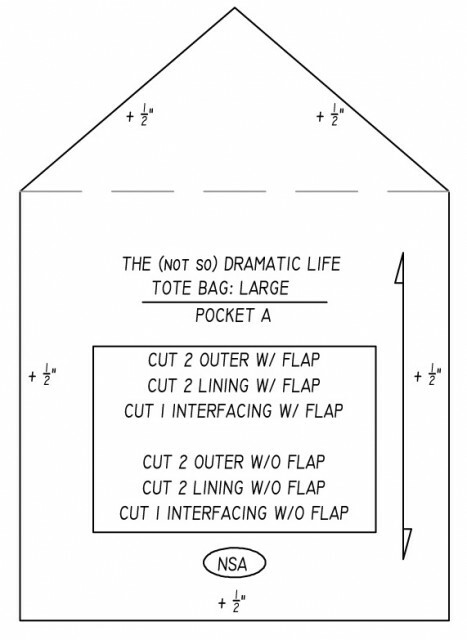 Once you have the rectangle drawn, you will determine the placement of the bag handles (shown as dashed lines in the diagram above). How wide do you want the pockets on your bag? 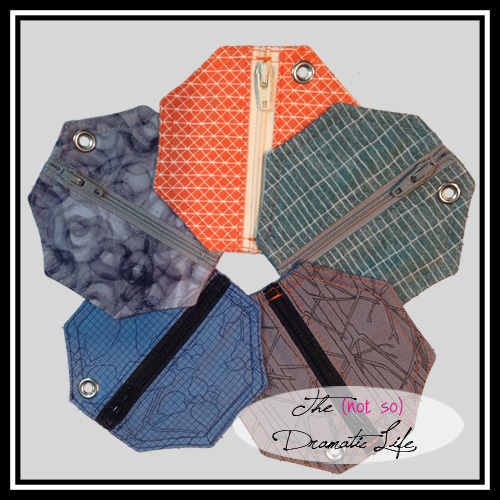 The pockets are placed between the handles, so their size will indicate handle placement. 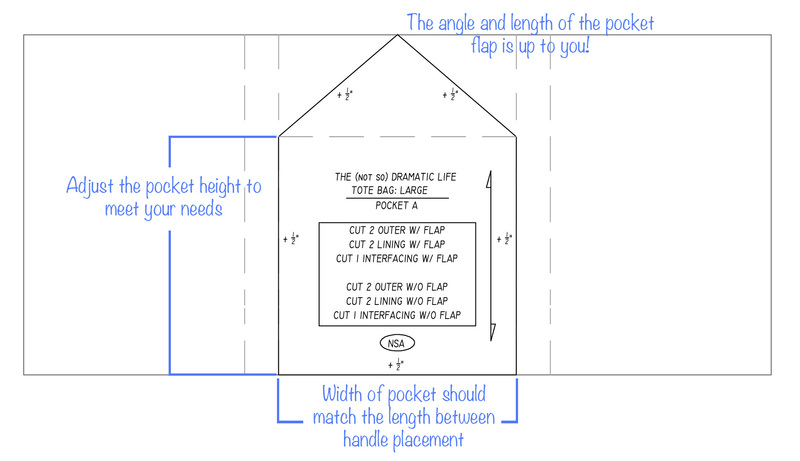 Subtract the desired pocket width from the width of the rectangle. Then divide that number in half. For example: 22″ (rectangle length) – 7″ (pocket width) = 15″. Half of 15 is 7.5″. This means that you will measure seven and a half inches from each side of the rectangle and draw a dashed line. Look at the proportions of what you have drawn. Adjust as needed, making sure that the pattern remains symmetrical. When you are happy with the pocket width, draw an additional dashed line 1″ toward the outer edge of the rectangle. The handles will be placed between the lines. Draw a grain line parallel to the edge of the rectangle. You will label each pattern piece as above- but make sure to list yourself as the pattern designer! 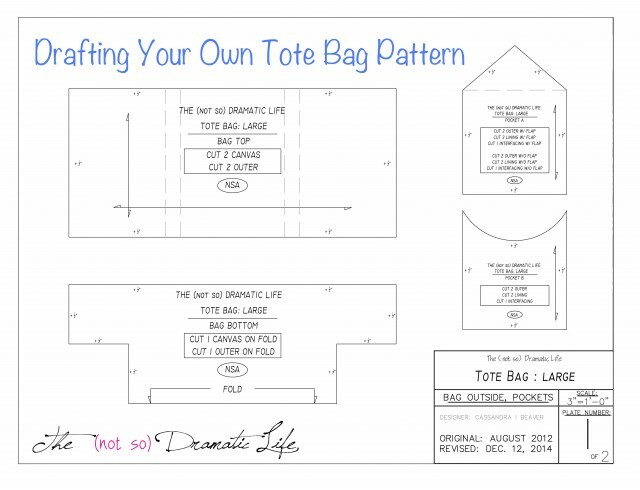 Indicate the appropriate size of tote, the pattern piece name, and in a box write how many pieces you will need to cut of each fabric. 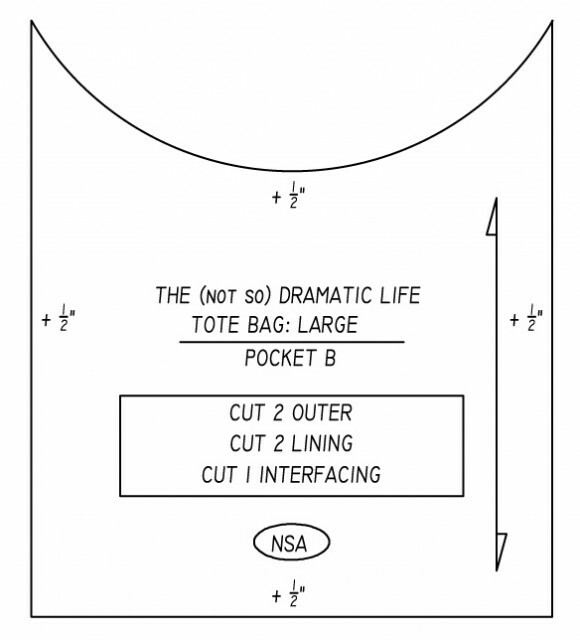 NSA means that you have included no seam allowance. 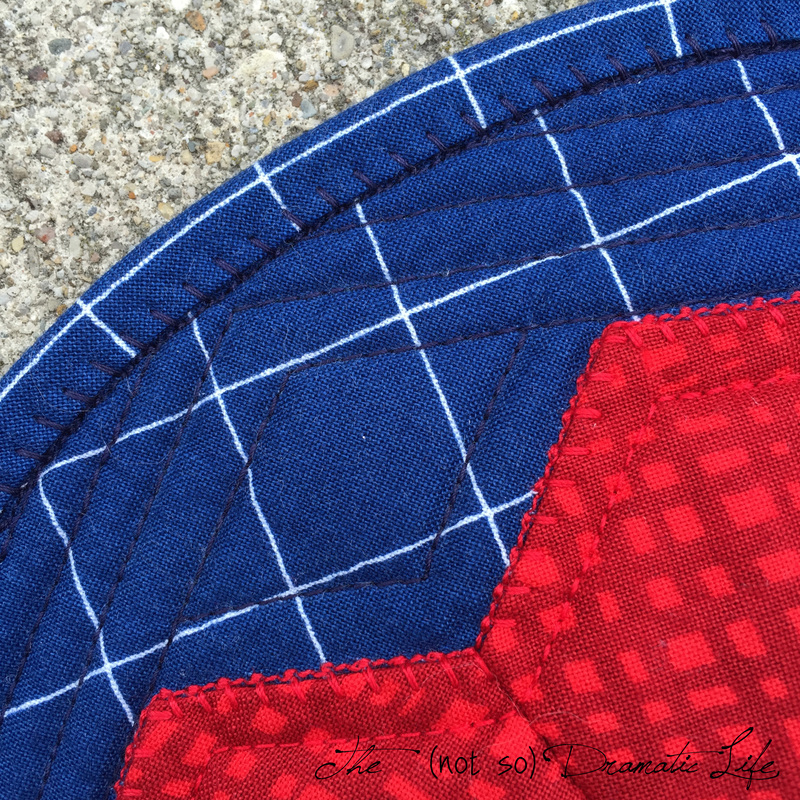 Along the edges of the pattern piece, you will write how much seam allowance you will want to add when laying out and cutting your bag. In this case I wrote +1/2″. Note: Omitting seam allowance in the pattern making process allows you to more easily make sure the pieces of the bag will fit together. 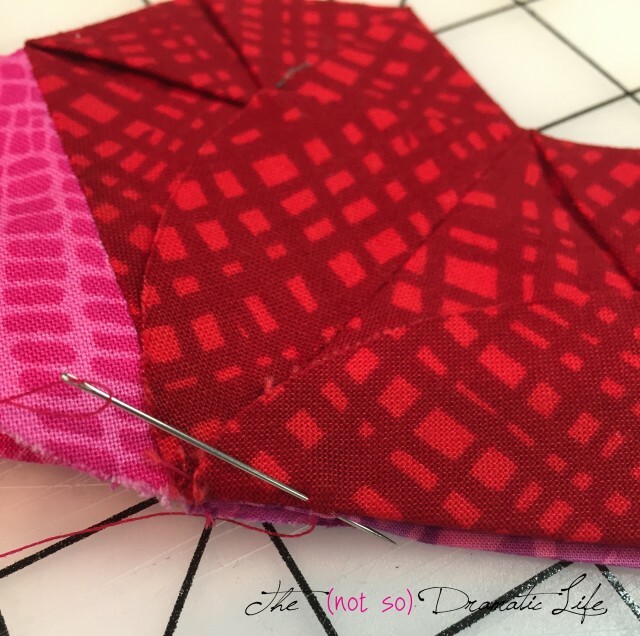 If you would rather include seam allowance in the pattern , you may tape on additional paper after all the pieces are drafted, or you may retrace each piece completely with the added seam allowance. 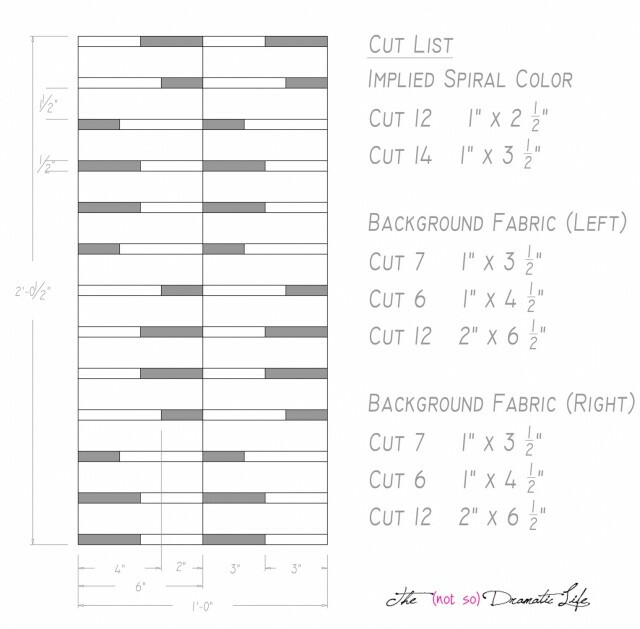 Commercially available patterns include seam allowance, but many people who sew one of a kind garments add seam allowance when cutting the fabric. 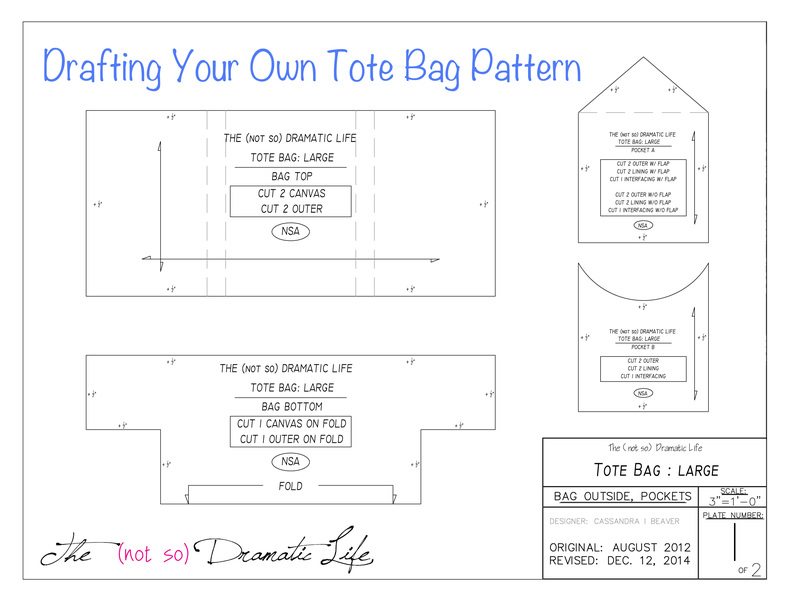 Once you have created the bag bottom rectangle, you are ready to add the shaping seams. If you have a square rotary cutting ruler, this is a good time to pull it out. The shaping seams are squares removed from the bottom of the rectangle. The vertical and horizontal lines must be of equal length, and the squares should be the same size on both sides of the bag. In the photo above I have drafted the bag top and bottom so that the bottom line of the bag top is the top line of the bag bottom. 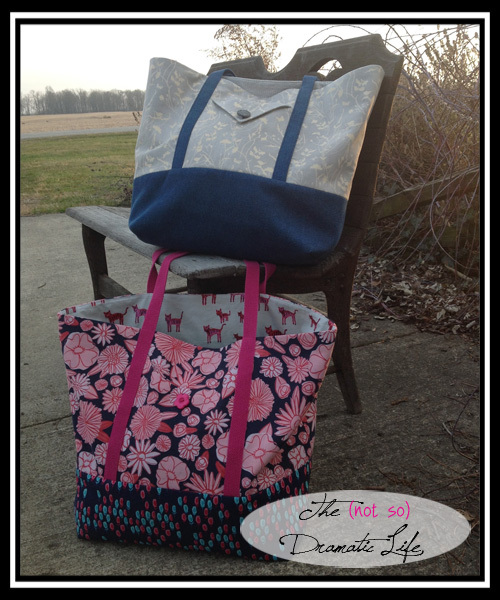 This guarantees that the length of theses seams will match up perfectly when you are sewing the bag together. The shaping seams in this photo form a 4″ square. 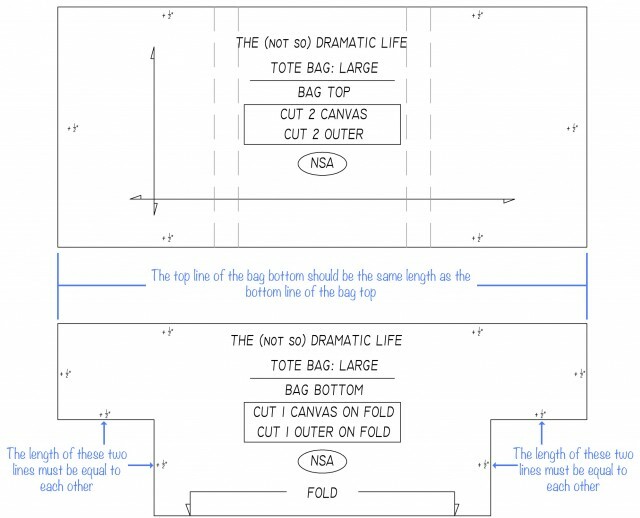 The Bag bottom piece will be cut on the fold of the fabric in order to eliminate the need for a seam at the bottom of the bag. Label the pattern piece as shown above, making sure to indicate the location of the fold line at the bottom of the pattern piece. The lining pattern is the next to draw. 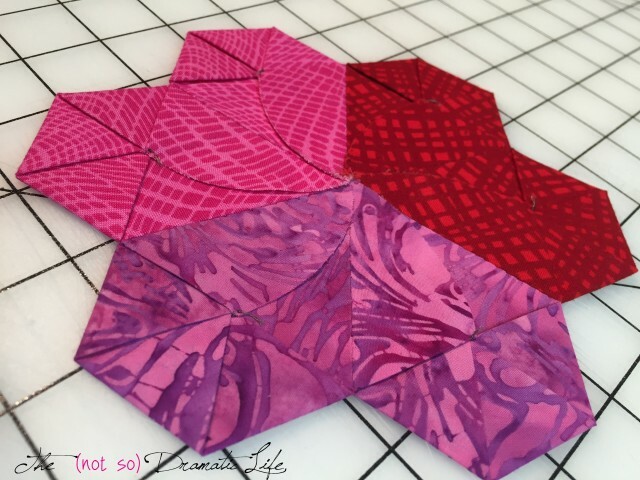 If you were able to draft the top and bottom pieces so that they shared a line (as shown above), you can create the lining pattern by cutting the exterior lines of the pieces while leaving the line connecting the pieces intact. (Do you see how I used push pins in the homasote topped table? You can also lay down foam core or a piece of foam core to pin into. Don’t have any of that? Try using pattern weights-or even a couple books to hold down your pattern pieces on your regular table) Carefully trace this piece onto another section of paper. Now you have the lining piece- easy right? 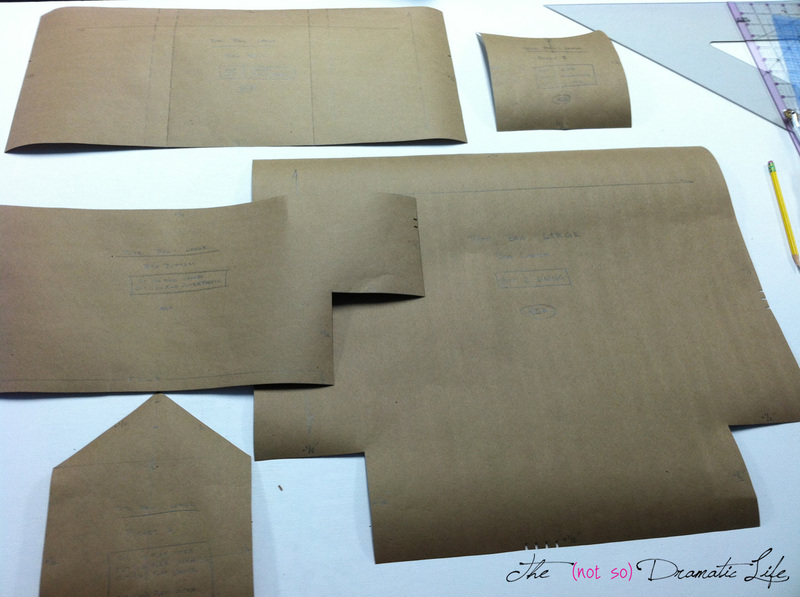 The lining pattern should be equal to the bag top and bag bottom pattern pieces combined. Add a grainline parallel to the edge of the pattern piece and label the pattern as shown below. Go ahead and cut out the pattern pieces you have made so far. Take out the bag top pattern piece, place the center of the pattern piece over another section of paper that is big enough to create a pocket pattern, and use push pins to hold it in place. Trace the bottom of the pattern using a pencil. Then pull out your tracing wheel to mark the interior dashed lines. 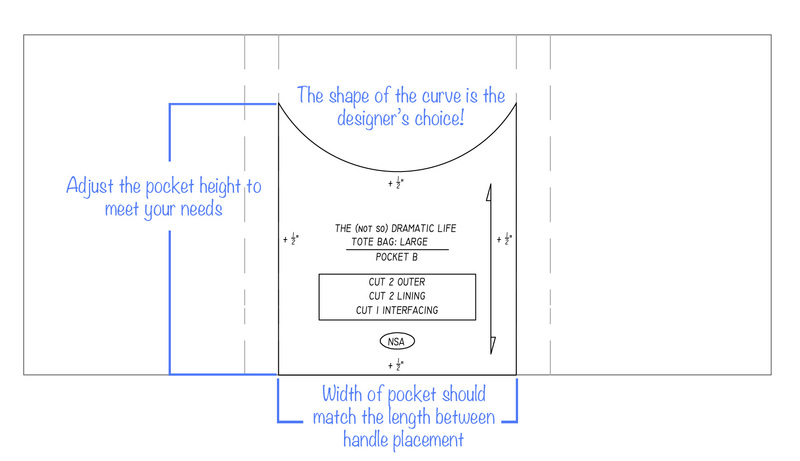 This will guarantee that the pocket width will correspond with the width between the bag handles. 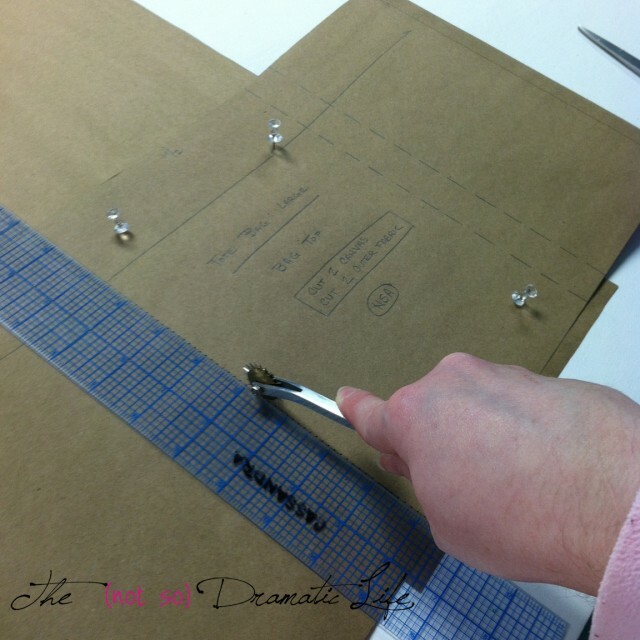 You may use a ruler to help ensure the line you trace is straight. Do you see how the pocket pattern will fit between the handles? The height of the pocket is up to you. A lot of people like to use this pocket for a cell phone, so you may want to use that as a starting point. The flap on the pocket makes it even more secure, so design something with proportions that are pleasing to you. Label the pattern as indicated in the diagram above. Don’t forget a grain line! The pocket for the other side of the bag is open with a curved top. 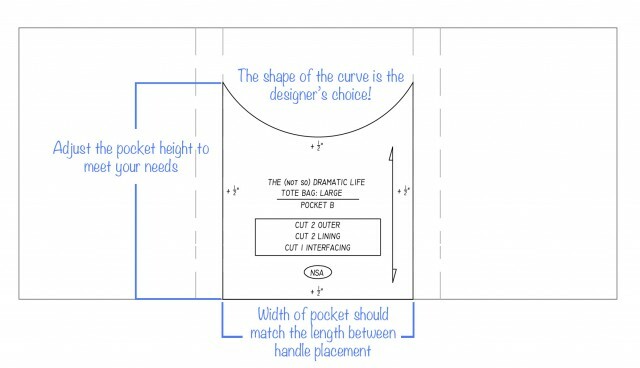 Create this pocket using the directions for the above pocket, but instead of designing a flap you will create a concave curve. Tracing around the edge of a plate or round container is a good way to make the curve of the pattern piece. Add a grain line and label the final pattern piece. Cut out all of your pattern pieces, and you have finished your tote bag pattern! Happy Dance! This post is linked up to Let’s Bee Social at Sew Fresh Quilts and WIP Wednesday at Freshly Pieced. Please stop by to check out all of the awesome work being created! 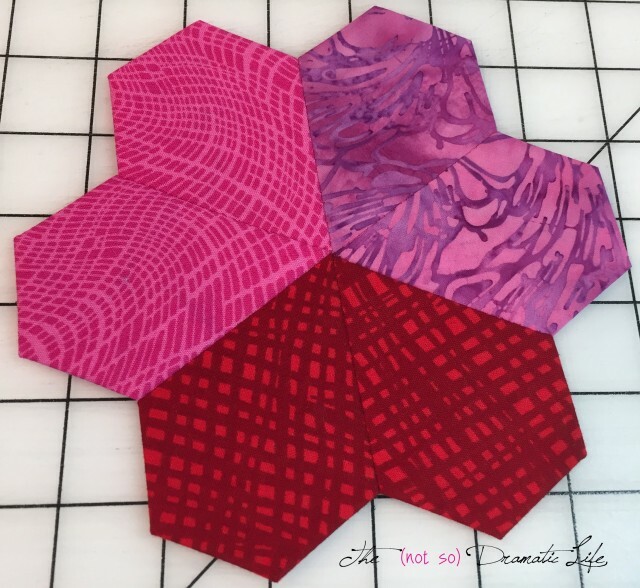 I had originally planned to post this sweet little mini quilt a bit closer to Valentine’s Day, but ultimately decided that there may be someone who could draw inspiration for their own heart-based endeavors in the coming weeks! I recently did a quilt with a lot of hexagons that were made by cutting a circle and folding the edges in to create the hexagon shape. In creating these pieces, I became curious about how these shapes would look if I omitted the final fold. The result is a vaguely ice-cream-cone-shaped piece. Two of these together make an adorable heart! To make these shapes you will want to start with a circle. I used a container from a round of Brie cheese, but this technique will work with any size circle. With the wrong side of the fabric out, fold the circle into quarters to find the center point of the shape. With a needle and knotted basting thread, catch 1-2 threads at the tip of the fold and pull the thread through to the knot. Unfold the circle with the wrong side of the fabric facing up and your thread coming up from the center of the circle. Take a small stitch at a point on the outer edge of the circle. You will want to insert the needle as close to the edge of the fabric as possible without the stitch pulling out of the cut edge. The needle goes in on the wrong side of the fabric and emerges on the right side. Now pull the thread through, bringing the edge of the circle to meet the center. Press the fold you have created with your fingers. At the end of the fold you just created, take another stitch and pull that point on the edge of the circle to the center. Finger press this fold, and take another stitch at the end of it. Pull this point into the center. Continue around the circle in this manor until you have an ice-cream-cone-shape. Knot off your basting thread or backstitch at the center point and take the shape to the ironing board to give it a good press. To form the center design, place the shapes right side together and whip stitch them together. You will end up with a shape that looks like this. The back is almost as pretty! I was originally planning to hand appliqué the shape to the background, but after thinking it over, I decided the hearts needed some additional emphasis in the form of more decorative stitches. I liked using decorative machine stitches on Fibonacci on the Seashore, and I was eager to experiment with using machine stitching for appliqué. For this project, I used a blanket stitch in a different color to stitch around the edge of each heart. 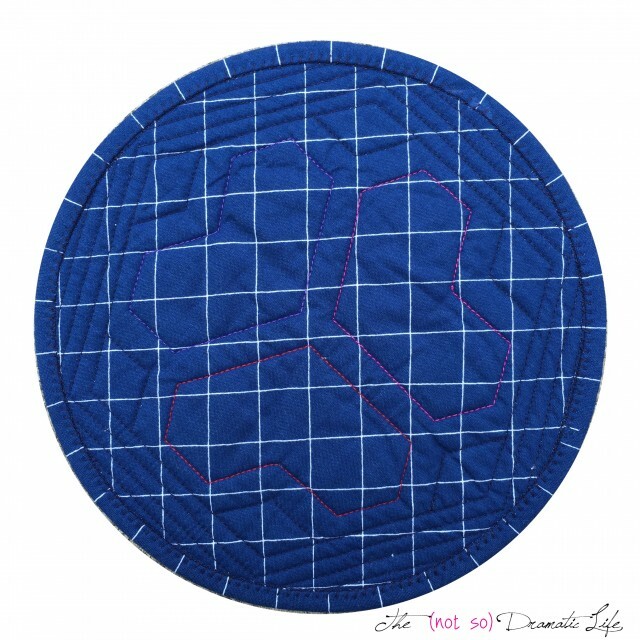 The hearts in this project are created without using curves, and I selected a gridded background for the piece. Given all the linear aspects of this mini, I thought it would be interesting to make the overall shape a circle. The radius for this 4.5 inches. The hearts are quilted a quarter inch inside the appliqué. 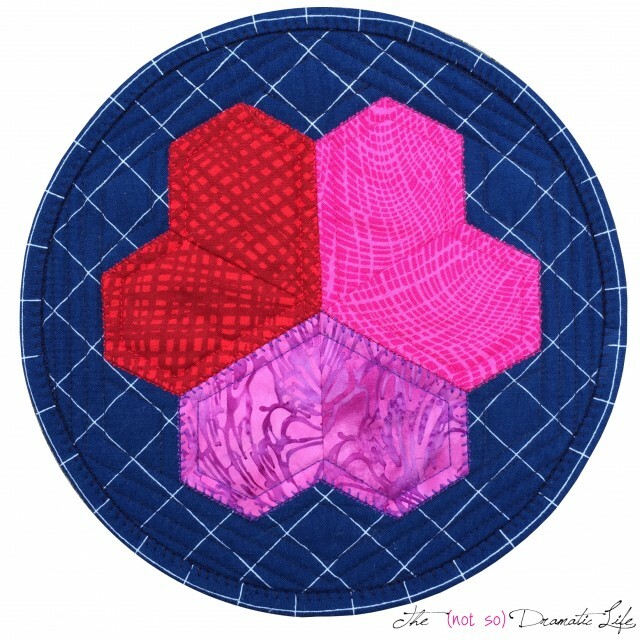 The background is a radiating hexagon shape, with diamonds filling in the gaps. The binding matches the background and backing, and I love the linear effect. It was worth the effort I made to match up the design. Fabrics: Background from Carolyn Friedlander’s Doe line. Hearts are 100% cotton prints and batiks. Thread: Pieced by hand using Magenta Gutermann Mara 100 (and Thread Heaven); Machine appliquéd with red, magenta, and violet Cotton Mettler Quilting Thread; Quilted with navy cotton machine quilting thread; red, magenta, and violet Cotton Mettler Quilting Thread. Binding: Bias strips cut at 2 inches, machine straight stitched to the back, machine blanket stitched to the front. I am linking this post up with Thank Goodness It’s Finished Friday at From Bolt to Beauty, Finish It Up Friday at Crazy Mom Quilts, Show Off Saturday at Sew Can She, Needle and Thread Thursday at My Quilt Infatuation, Fresh Sewing Day at Lily’s Quilts, and Whoop Whoop Friday at Confessions of a Fabric Addict. I hope you take a moment to see all of the wonderful work being created! I love this tote bag! I have made many of them over the years for myself and others. The best part about this particular bag is that anyone who can sew a straight line with a sewing machine can make this tote! This is often the first project I have students (most of whom have never sewn anything) take on while learning to sew. This is going to be a five part tutorial, with one section coming out each week. I am putting in a lot of pictures and directions, so some of these posts will be lengthy- but hopefully in a good way! Who is this tutorial intended for? 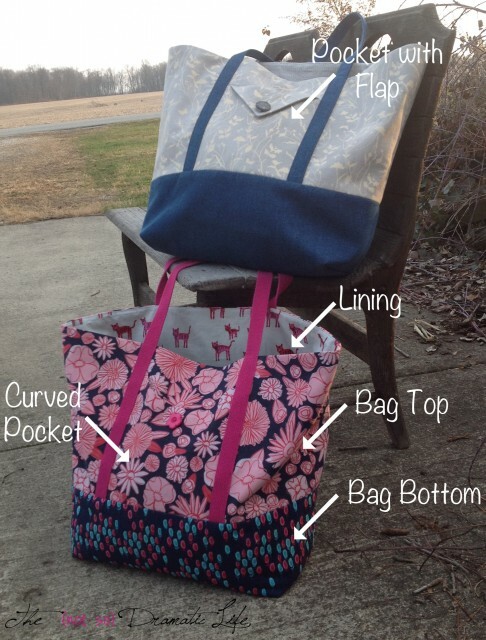 Anyone who wants to try making their own pattern- That’s right you will be making this bag from a custom pattern that you will create to fit your needs! Are you on board? If so, you will want to start gathering the following supplies. I often list what I use, and then follow up with one or two other options. Just choose the material you are the most comfortable using. If you have questions please leave a comment or email me, and I will do try to help you figure out what you need. Large paper- I keep a roll of brown paper on hand to make patterns. It was purchased in the paint area of a big-box hardware store. You can also use something like freezer paper or tape together several sheets of printer/notebook paper if you don’t want to purchase a roll of brown paper. A ruler with clear and accurate measurements. 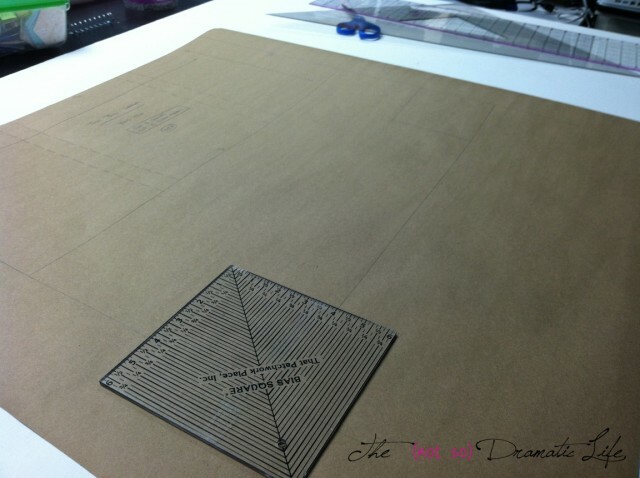 I usually use a 2″x18″ gridded ruler found in most art, drafting, or sewing stores. You can also use a good rotary cutting ruler or metal ruler. A 90º Angle- I usually use a large drafting triangle. Other possible options are a tailor’s or framing square or a square rotary cutter ruler (the larger the better). A surface with a bit of give. My table is covered with a painted, muslin covered piece of homasote. Homasote is a construction material originally intended to function as a sound barrier, but it can act as a low cost bulletin board since it is firm and still easy to push a thumb tack into. A cork board placed flat on the table or a piece of foam core are also plausible options. Ruler, pencils (or other marking device that will show up on your fabric), perk wheel, surface with a bit of give, and push pins from the list above. Straight pins- whatever size and type you prefer. I use size 21 with glass ball heads. Tracing Paper (the type with a colored chalk or waxy coating on one side and plain paper on the other) I like using large sheets of tracing paper in light blue that I get from Richard the Thread. 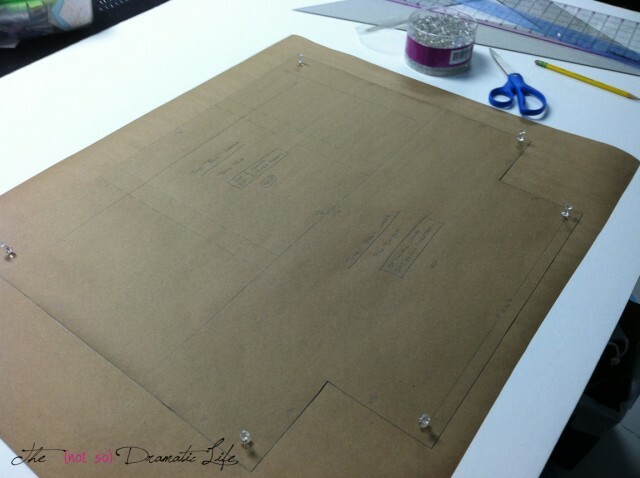 (Not a sponsored post- I just really like this tracing paper for bag and garment projects!) For this project you don’t necessarily need to make that kind of investment, the small sheets from most large sewing stores are ok.
1/3 yard of fusible interfacing, woven if possible. I typically use Pellon Shape Flex Woven Fusible Interfacing that is generally available at big box sewing stores. About 3 yards of webbing for your bag handles. I usually use cotton webbing 1″ in width. Thread to match (or coordinate with) bag exterior and bag lining. Sewing machine with bobbins, needles, etc. 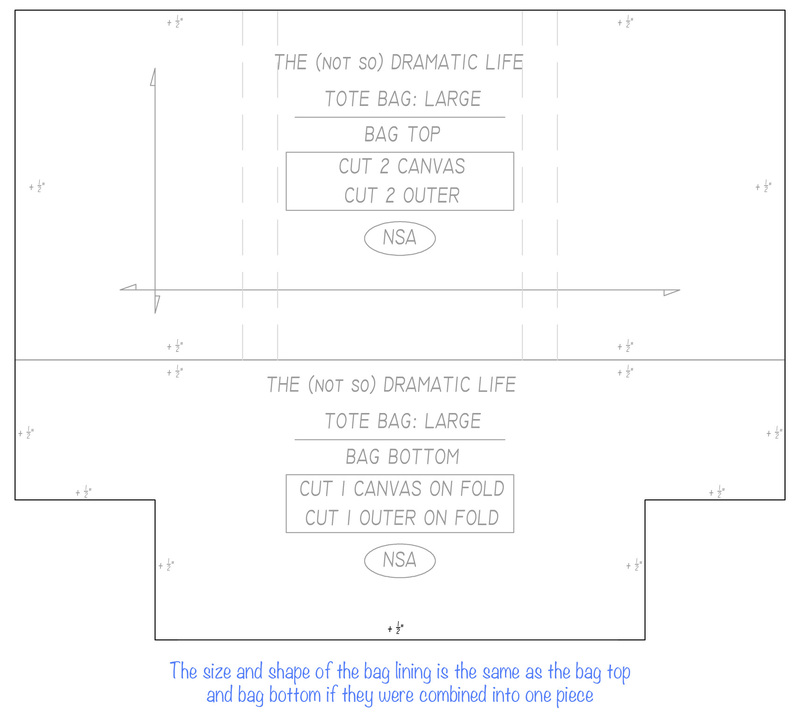 I am really excited to share the process of creating this bag, and I hope you will enjoy making this skill building tote! 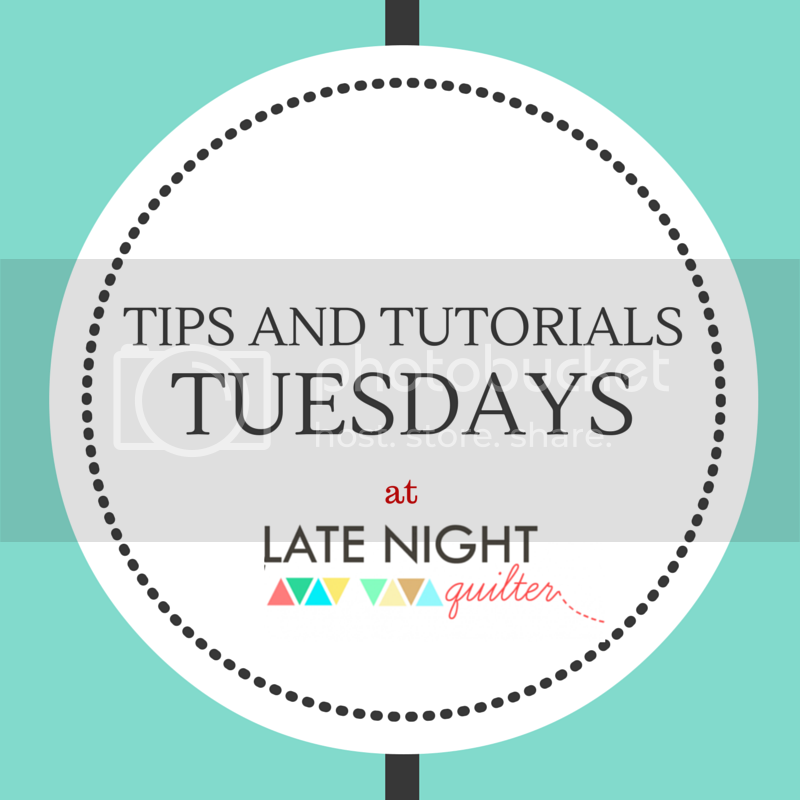 This post is linked up with WIP Wednesday at Freshly Pieced, and Tip and Tutorial Tuesday at Late Night Quilter. Please stop by to see all of the beautiful projects being created. 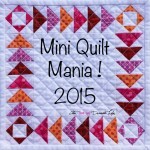 Mini Quilt Mania continues this week with Implied Spiral which is the third mini quilt finish for the year! I started this week by doing some drafting for a theatrical scenic design which included two spiral staircases. The first thing I do when drafting a staircase is to rough in the stair placement, and it occurred to me that this type of visual may be an interesting inspiration for a quilt. 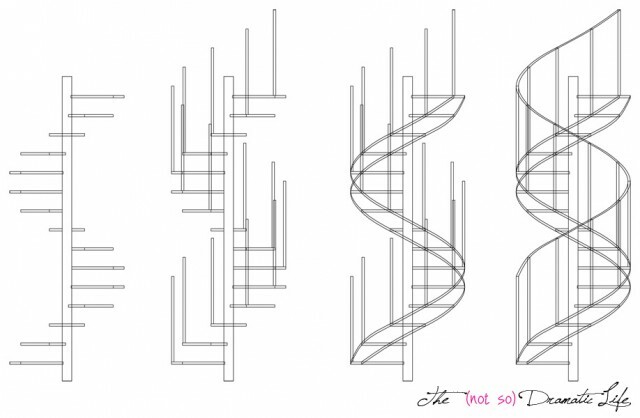 I especially like seeing several spiral staircases together (like in the step by step image above) When looking at a spiral staircase from the front, the stair placement shifts from one side of center to the other. I sketched designs with and without the central post, but ultimately decided I liked the simplicity of the design without a separate vertical design element. 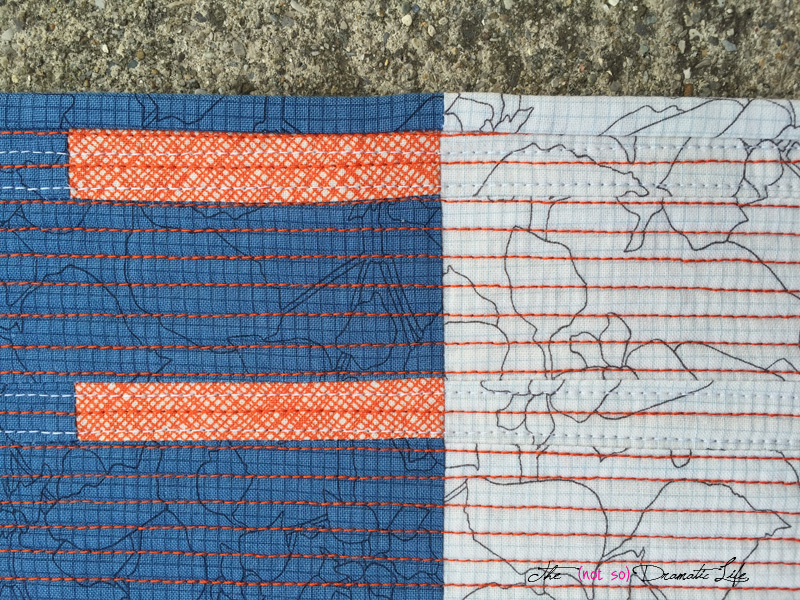 I did, however, want to emphasize the shift from one side of the quilt to the other. 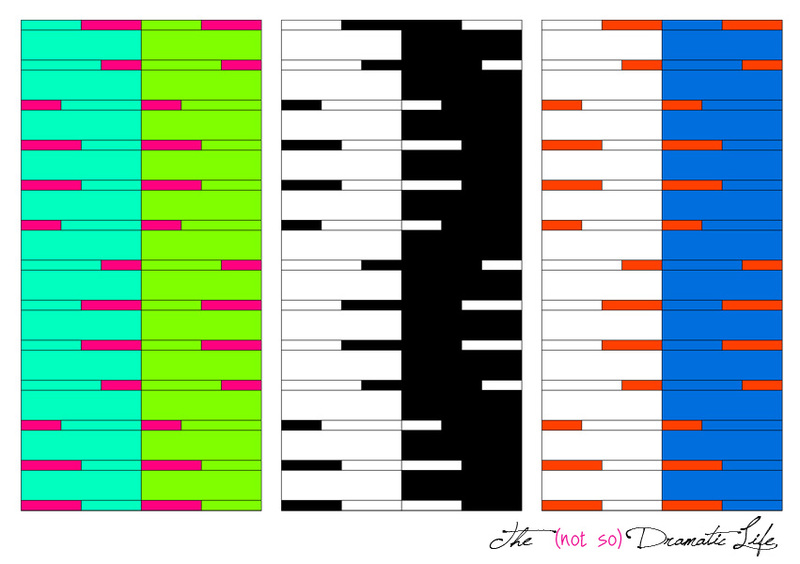 This is how I decided to use a color shift to define the vertical areas of the design. I started a pair of bright colors for the background with a single, sharply contrasting color for the stairs. Then I experimented with a black and white version in which the stair and background colors would reverse on each side. Finally, I combined the two ideas by using a consistent “stair” color with contrasting background colors. 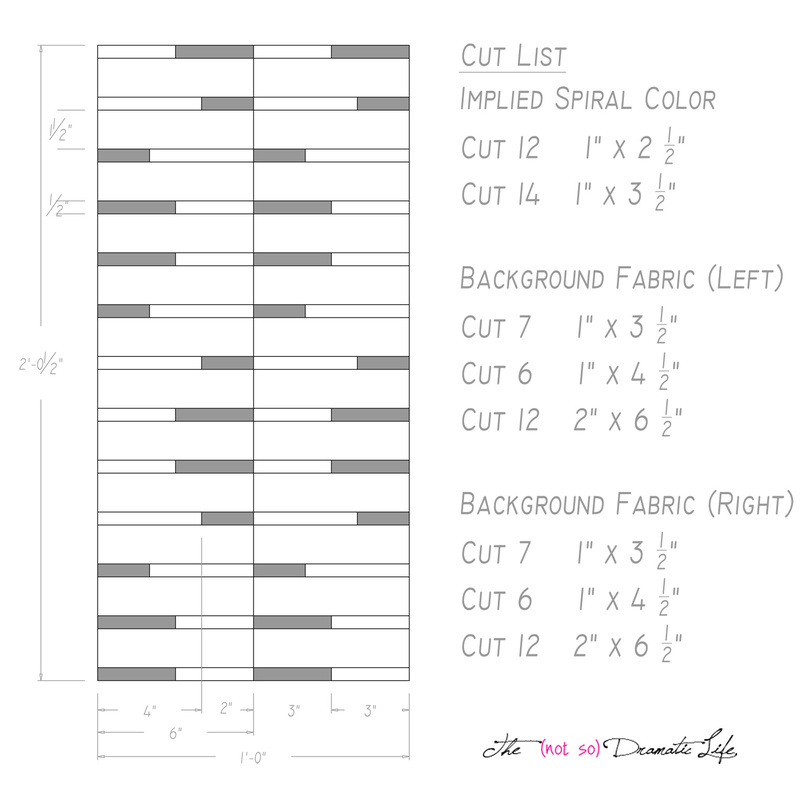 I made up a quick cut list and layout for the design to help in translating the design from the computer to fabric. Once the quilt top was assembled, I selected a blue from the stash to serve as a background. I knew I wanted to do heavy horizontal quilting, so I thought a solid would show off the stitching without competing with it. 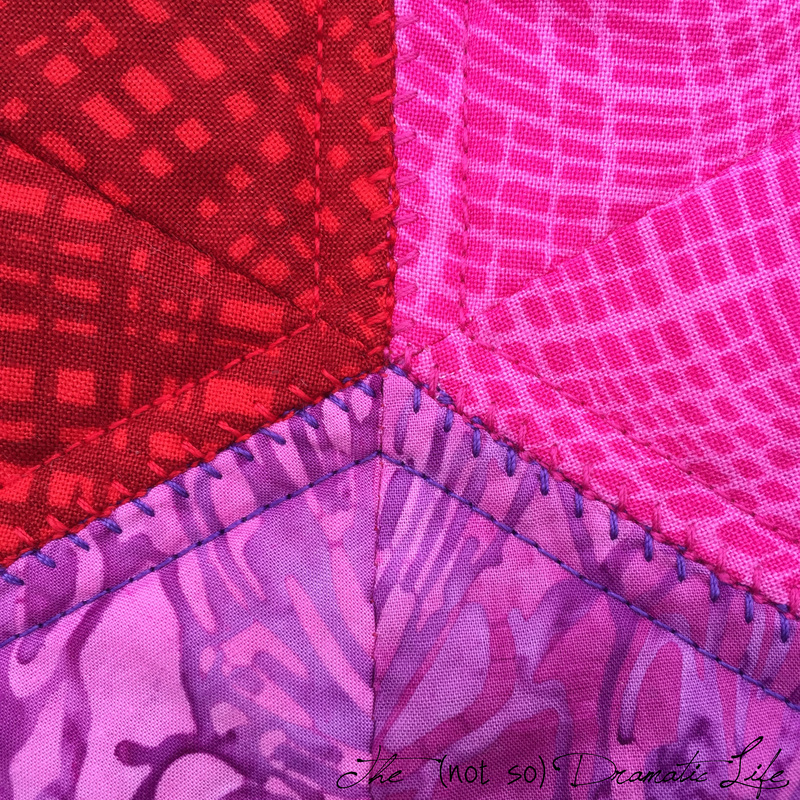 I wanted to create a sense of continuity in the application of the quilt binding, so I chose to split the binding fabrics at the center line of the quilt. I like the linear simplicity of this quilt, and I may create a longer version to function as a modern table runner. Binding: Straight grain binding, cut in 2″ strips, machine stitched to the quilt front and hand stitched to the back. 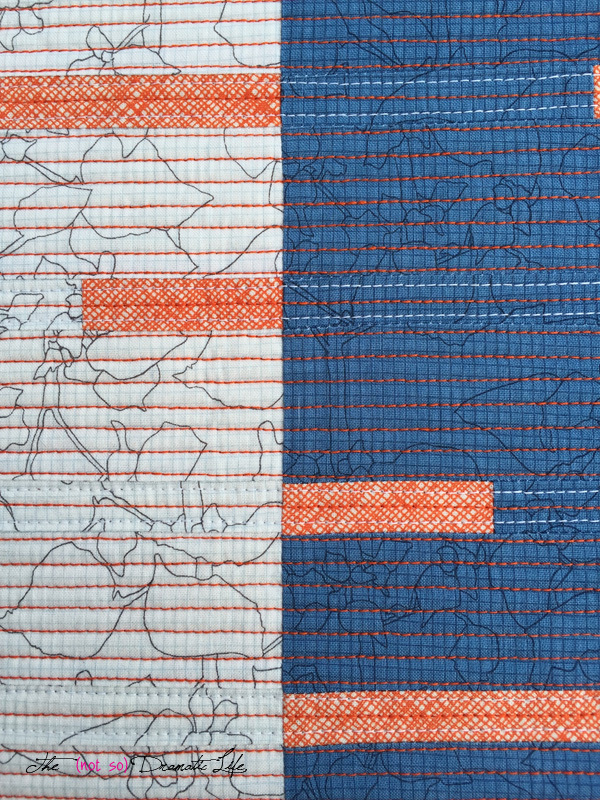 Binding color shifts to match the background fabric. 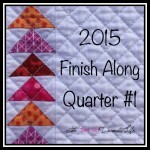 I am linking this post to Finish it Up Friday at Crazy Mom Quilts, Show Off Saturday at Sew Can She, Sew Cute Tuesday at Blossom Heart Quilts, Let’s Bee Social at Sew Fresh Quilts, Needle and Thread Thursday at My Quilt Infatuation, and Whoop Whoop Friday at Confessions of a Fabric Addict. Please drop by to see all of the wonderful work being done!